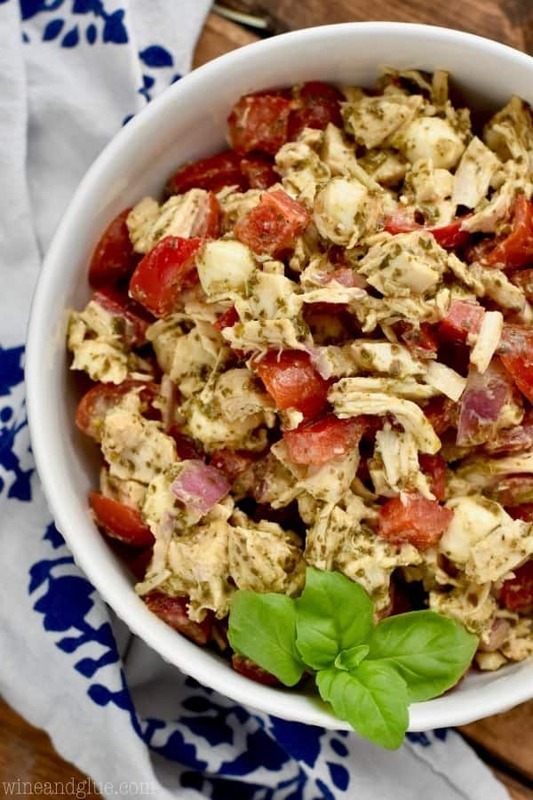 This Italian Pesto Easy Chicken Salad Recipe is the best spin on traditional chicken salad recipes! It comes together with easy to find ingredients, and the flavors combine perfectly. 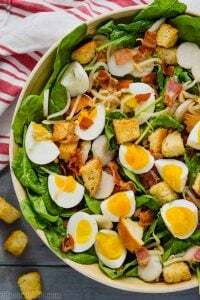 This spin on homemade chicken salad is perfect for feeding a crowd. 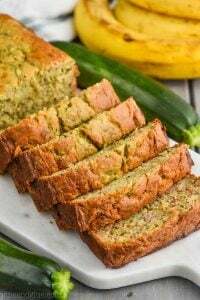 There are so many recipes that I love sharing with you guys. 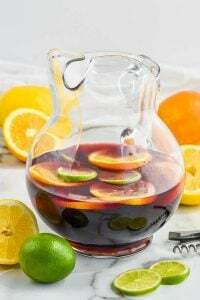 I love sharing cocktail recipes with you because there is something about putting different flavors of booze together in a creative way that makes me giddy. Like it’s not even always the drinking of it . . . okay, it’s the drinking of it too, but I just love making new concoctions. One that made me feel like a genius was my Mojito Margarita! And I love making you guys super simple and easy dinner recipes. Because obviously that is something that we all need, and eating the same thing all the time gets boring ya’ll. 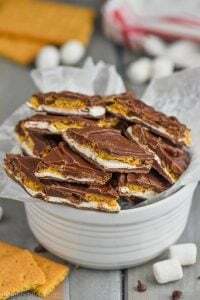 But I have to say that maybe one of my *super* favorites (another lie, they are all my favorites) kind of recipes is dishes that you can take to potlucks. You know, the ones that are just perfect for a family BBQ or a baby shower or a family reunion. Recipes like my Taco Pasta Salad or my Italian Pesto Sliders or this *amazing* Spinach Dip. I have thrown so many of those types of events, and every time I do I make some of the classics (always this Crab Pasta Salad) but I also love bringing something new to the party too! Sometimes I search out something that looks like it will be amazing and sometimes I come up with a new one. So this is a new one for me and a new one for all of you searching out things to bring to your summer BBQs and family picnics. Pesto is always a hit to me. It adds such a great flavor to whatever you throw it in! 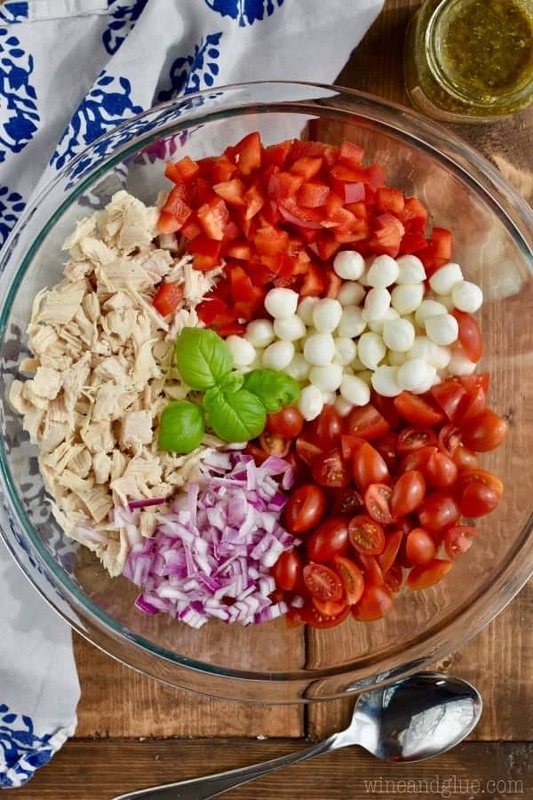 This Italian Pesto Easy Chicken Salad Recipe is full of all those things that compliment pesto perfectly, mozzarella, red peppers, red onion, and tomatoes. And then of course chicken. 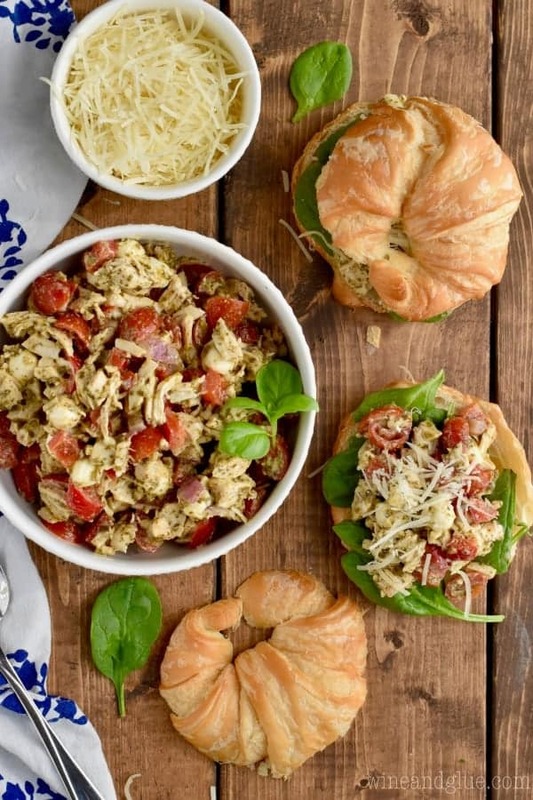 It is super simple to throw together and so delicious. I couldn’t stop taking nibbles of it. Always a sure sign that you have a winner. 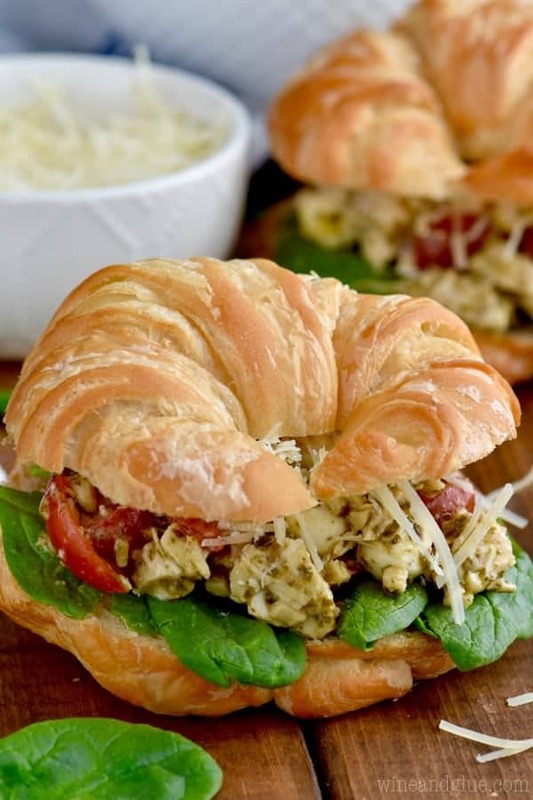 I served this easy chicken salad recipe on croissants with a little shredded parmesan and spinach. Perfect! In a small bowl mix together the mayonnaise, pesto, garlic powder, onion powder. In a large bowl mix together the remaining ingredients. Stir in the sauce and then add salt and pepper to taste. Please note that the nutritional information is just for the chicken salad and not a roll, croissant, or any fixings to put on a sandwich. Easy peasy and perfect for summertime! I love the little mozzarella pearls! I want to go in and grab every one of those! Can you buy these mozzarella pearls, or do you carve them out of a block? 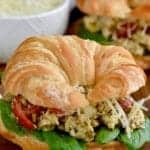 Can’t wait to try these sandwiches on my bridge group. Where do you find the pearls? Deli? Brand? I found them with the fresh mozzarella in the cheese section. In some stores it is sold with the specialty cheeses. This looks very good. I’m curious about the mozzarella pearls. I’ve never seen the pearls in my local Kroger. You find them near the fresh mozzarella! they are so good! Please accept my heartfelt wishes and prayers for you and your family and I just want you to know your mum is with you always in spirit and in your heart. I am so very sorry for your loss and time does help. I understand how you feel, I lost my dad when I was 14 and my mum, God love her, is now 85 in a nursing home with advanced dementia. Although, and I’m very lucky for this, she knows me, she and I can no longer have those wonderful chats and share our interests and feelings with each other. I love her to the moon and back infinity times and feel your loss. Take care, enjoy your children (they grow up way too fast) and use the strength and love you have from friends and family to “keep on keeping on”!!! Oh and love the chicken pesto salad!!! Thank you so so much for your kind words Julie!